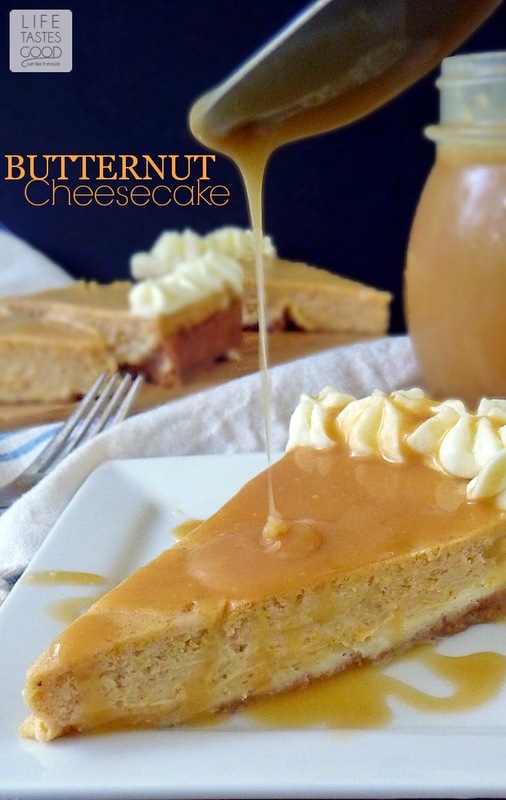 Butternut Cheesecake is smooth, creamy, and smothered in caramel sauce! Need I go on? 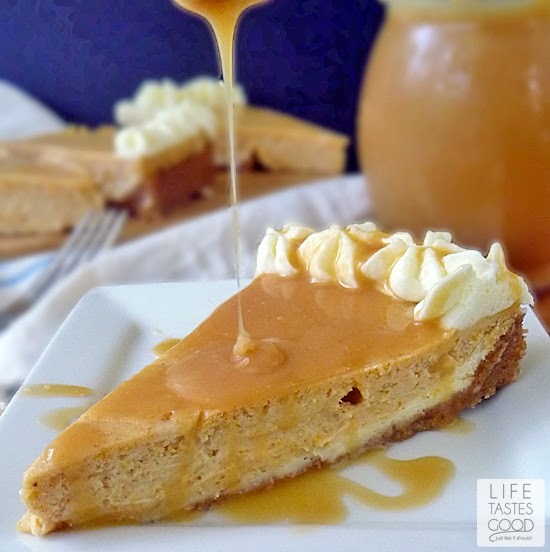 Anything smothered in caramel is a WIN in my book! Butternut Squash is similar to pumpkin, but it has a milder taste and smoother texture. 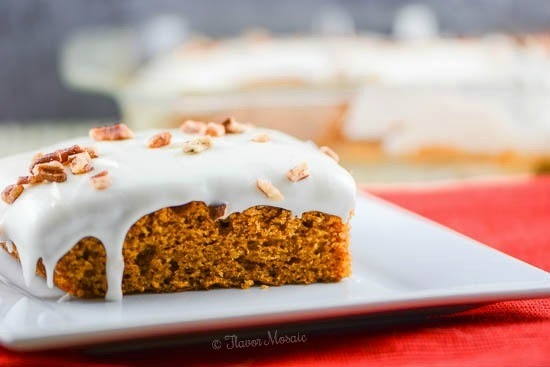 If you are like me and don't go gaga over pumpkin because it tends to overwhelm your taste buds, then you simply must give Butternut Squash a chance. 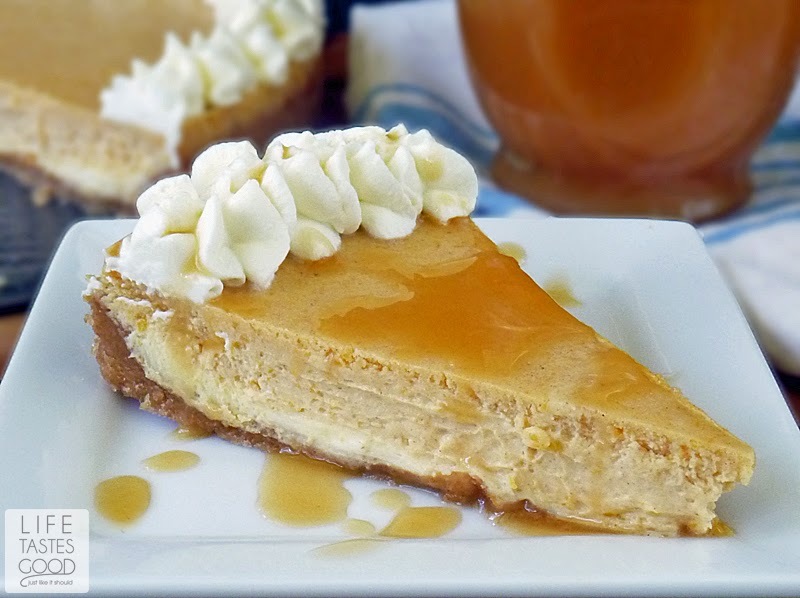 This Butternut Cheesecake would be a perfect ending to your delicious Thanksgiving feast. You can make this up a day or two ahead of time and feel confident it will be wonderfully luscious when you serve it on Thanksgiving. Preheat oven to 325°F. In the bowl of a Food Processor , pulse graham crackers until finely ground. This should be about 1 1/2 cups. 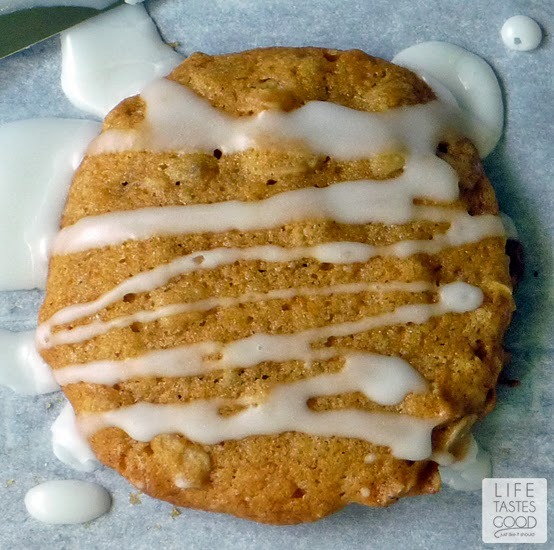 Add 1/3 cup sugar and 6 tablespoons softened butter and pulse until combined. Press graham cracker crumb mixture into a 9" Springform Pan and set aside. Clean out the bowl of the food processor and add 2 (8 ounce) packages of softened cream cheese, 1/2 cup sugar, and 1/2 teaspoon vanilla extract. Pulse 2 times and then scrape down the inside of the bowl. Pulse 2 more times and scrape down sides again. Repeat as necessary until smooth. You don't want to over mix. Add eggs 1 at a time, pulsing in between. 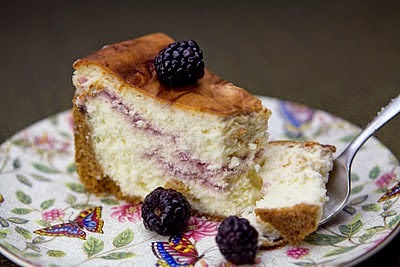 Measure out 1 cup of the cheesecake batter and pour into bottom of crust, spreading as needed. Set aside. Add 1/2 cup Butternut Squash Puree, 1 teaspoon ground cinnamon, and a pinch of salt to the remaining batter in the bowl of the food processor and pulse once or twice until just blended. Carefully pour this mixture over the batter in the pan. Spreading gently as needed. Carefully wrap the springform pan in foil to prevent water from reaching the pan. Place the pan on a baking sheet. Pour water into the baking sheet to fill about 1/2 way. Place baking sheet on center oven rack and bake in the preheated oven for about 35 minutes, or until the center is almost set. 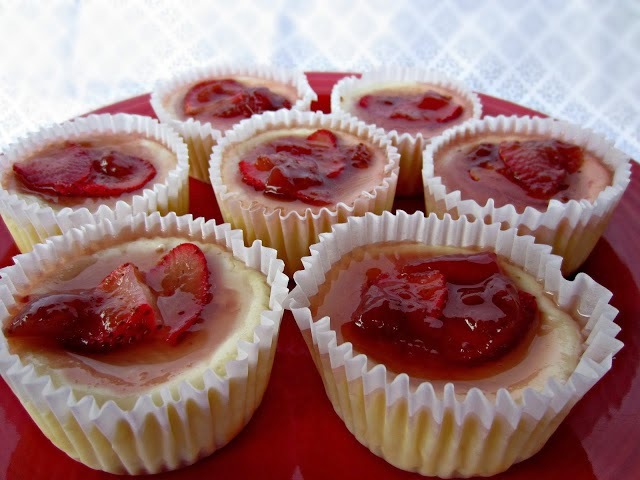 When you gently shake the baking sheet the center of the cheesecake will jiggle like jello. Turn the oven off and open the oven door to the first stop. Leave the cheesecake in the oven for 1 hour. When the timer goes off, remove from oven and allow to cool the rest of the way on a wire rack. Leave the sides of the pan on for now. Once cooled completely, leave the sides of the pan on, and place in the fridge overnight. When ready to serve, remove the sides of the springform pan. Top with homemade whipped topping and smother in Homemade Caramel Sauce and enjoy! I'm a sucker for anything smothered in caramel! This looks amazing, Marion. 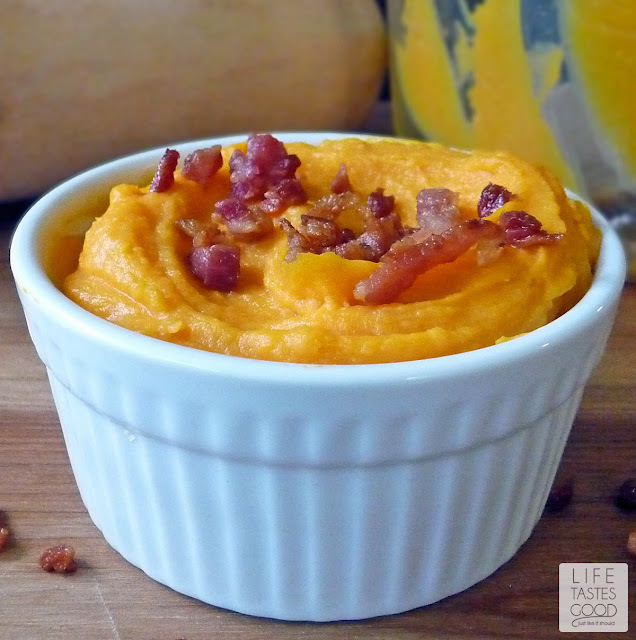 I love the idea of using butternut squash instead of pumpkin. Super delicious! Thanks, Valerie! I'm the same about caramel - it's an obsession! Great Jennifer! I hope you get to try it - it definitely disappeared quickly in our house! This looks luscious! I bet it would freeze well too and then thaw it the day before in the fridge. It didn't last long enough to freeze in our house haha!! Thanks for stopping by, Mary Ellen! I love the flavor of butternut squash! It's so good for you. Eating your veggies never sounded so good! 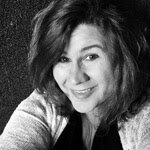 I couldn't agree more, Sandra!! Thanks!! Oh how I adore butternut!!! I've baked with it, but never put it in a cheesecake. I call that pure brilliance. Well done!